Axiomtek's wide-temperature SBC84826 3.5-inch embedded board is designed for solutions used in unconstrained thermal environments like outdoor embedded system, medical, industrial control, automation, and gaming machine. 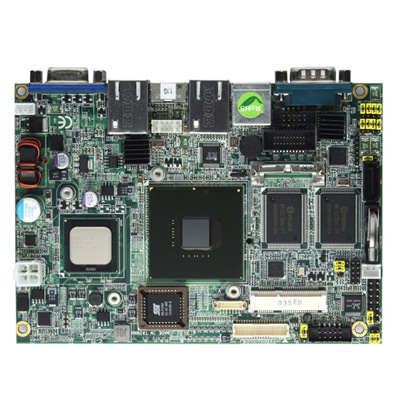 The rugged yet super compact size SBC84826 supports an industrial-temperature grade Intel Atom processor Z510PT 1.1 GHz with the Intel System Controller Hub (SCH) US15WPT. It offers -40°C to +85°C wide temperature range and only requires +12V DC power input. One DDR2 SODIMM on board implements up to 2GB of system memory. The onboard Intel SCH US15WPT features the Intel GMA900 graphics engine which utilizes up to 256 MB frame buffer and supports DirectX 9.0E and OpenGL 1.4. Dual displays are supported by an 18/24-bit LVDS interface and VGA interface. Rich I/O connectivity includes high definition audio, two LANs, four USB, one SATA, and four COM ports.